As we're doing the biodiversity surveys of our backyards, something to keep in mind is how does everything fit together? There are several ways to think about that, but today we'll concentrate on classification. In other words, how is everything related to everything else? 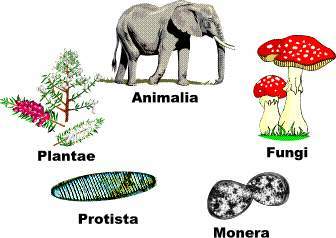 Then a long (but not LONG) time ago, a dude named Linnaeus put most everything was put into either the plant or animal kingdom. That was fairly simple. "Hey, organism, do you move?" "Yes, then you must be an animal." But of course there are always a few organisms that don't quite fit the mold (pun intended), so over the decades, classification schemes changed, with some lumping and some splitting. I won't go into details. If you want the details, click here. You probably had to memorize these for ninth grade science. What words did you use to remember the acronym: KPCOFGS? You probably didn't have access to this cool website, which suggests acronyms for you to use. You can leave your answer in the comments. Or perhaps you have a better one. So this is how it works. Everything fits into a kingdom. 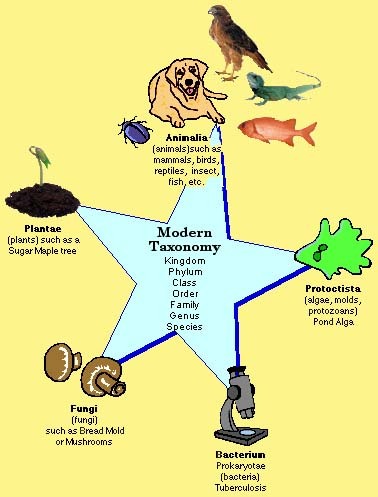 Then each kingdom has several phyla (the plural of phylum; yes, those years of Latin in high school did actually teach me something!). The phyla contain classes, and so on. The diagram above shows how a leopard is classified. It is a member of the Kingdom Animalia (it does move! 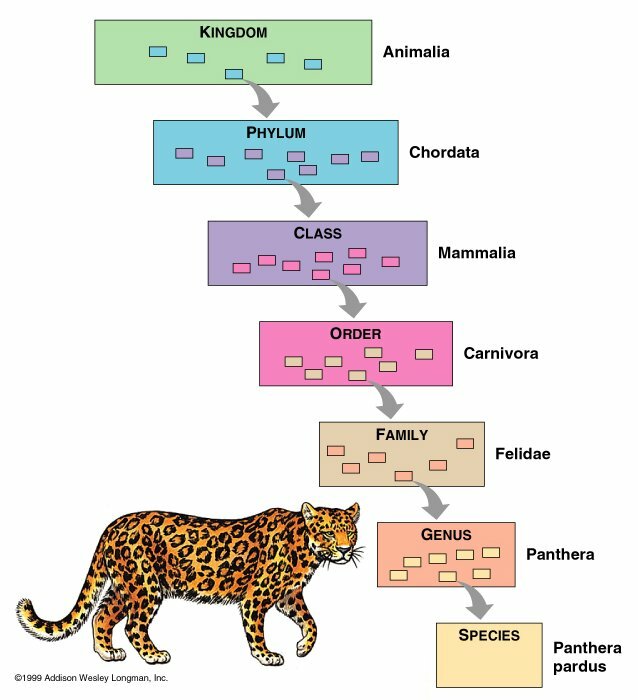 ), Phylum Chordata (it has a backbone), Class Mammalia (air breathing vertebrate animals with hair, 3 ear bones, and working mammary glands in females), Order Carnivoa (placental mammals and meat eaters), Family Felidae (the cats), Genus Panthera, and Species pardus. Does anyone else find it slightly unnerving that humans (and all animals) are more related to fungi than plants? If you're read this far, give yourself a pat on the back. I'll leave you with a little picture. Have a good day. Where ever you fit into it! Knights protect castles, ogres form groups, silly! Kangaroos poop corn out for good sanitation. Yeah! I thought it would be easy to come up with, but it wasn't! Maybe we can call you this weekend since 3 of us will be together for the race. Keep Pots Clean or Family Gets Sick.